The end-of-summer, I-have-knit-nothing-for-my-progeny freak-out session is now officially over. Actually, it's not. But it has been replaced with my new freak-out session titled: my-family-and-friends-have-been-so-generous, the-least-I-can-do-is-knit-something-to-show-my-appreciation. 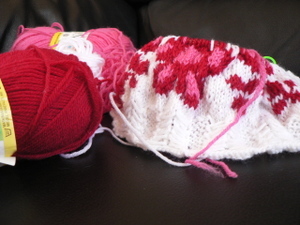 This little hat is a stash-buster (woo hoo! 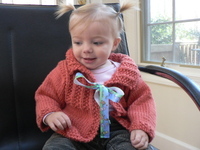 ), made of a cashmere blend yarn and my own wingin'-it pattern. Amazing how the incentive to stash-bust correlates to price of yarn. 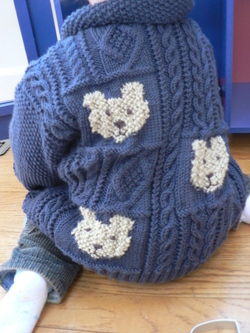 But it is luxuriously soft, and may I say that this will be the only cashmere item I EVER make for a baby! For next time - the Lola's are finally 100% finito and sent to their intended recipients (little jolly dance here), and the felted bag is a mammoth pile right now - let the felting experiment begin. What, you can't tell? Really? Well, I will keep you in blog-land suspense. So, remember how I said the Debbie Bliss patterned yoke jacket would be a quicky? Well, for most people, it would. But if you have the tendency to have >5 projects going at once, plus you are a full time student (careerwoman, mom etc...), plus you have a job, plus you are pregnant/sleepier than usual, may I warn you that this project could take up to several weeks. Although the basic math, regarding the total amount of time from start to completion, is still quite manageable - that, I promise! You probably see what I see - a lot of little ends. And it's not even the sewing that is that bad, really. It's that I have to get my iron out to do a bit of blocking on those little sleeves. Is there an excuse for not doing that? Well, yes. I also got a new knitting book. Now, I usually thumb through books for months before I drop the cash on them - but for some reason, this one was an impulse buy. And I hope to make a few things from it - although I mostly got it because I think Teva Durham has very interesting constructions, and it's inspiring for other projects, as well. So, the next post will hopefully see a completion of the Lola sweaters (nope, haven't made it to get the ribbons yet) and the patterned yoke jackets. Which, of course, will mean - choosing a new project to start!!! First, a BIG HAPPY BIRTHDAY message for my sister, who is turning 26 today!!! Now that I have disclosed my conflict of interest, as I did get the book for free, I will say that I think this is a good resource book to have, particularly for beginner knitters. And I would especially recommend it for presbyopic new knitters (aka, those over the age of 40 who require reading glasses) because the photos are quite crisp and very large. There are good explanations and a few patterns (not anything too heinous, but nothing I am jumping up and down to knit, either). But what of my knitting you say? The Debbie Bliss patterned yoke jacket is progressing - see? This is really quite a quick knit, and anything that saves me on seams (without compromising the drape of a sweater), is going to be a winner in my book! 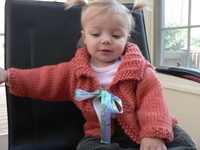 And look - do you see sewed seams and even stitches for an edging picked up on the little turquoise Lola sweater? No need to squint, people - this is the real deal! Also, I got a few requests for the Pink Kimono Pattern: It's a Reynold's pattern, #82085. I did not use the suggested yarn, but Berocco Lullaby, and it turned out to be a good substitute. Plus, this same pattern has the instructions for the Psychedelic Cabled Sweater I am making. About to plunge into mid-terms, which should not be appalling, but probably won't leave too much time for knitting early in the week. But I will certainly be procrastinating by reading all your interesting blogs, so I hope the rest of YOU have a great knitting week! *Note that I took this photo-op to show all of you the wonderful minty-green color we painted the baby's room this weekend - I thought a photo of just the wall would be a bit bland. To make up for my boring coral blob from the last post, here's an updated photo of the Debbie Bliss patterned yoke jacket. The body is constructed all in one piece, and on size 10.5 needles, this little sweater is a zip! The smallest size is a 9-12 month size, but I tend to find that Debbie Bliss patterns run large, and I think this one is no exception. Although maybe my baby will be a cute little chunker, and I will bite my words later, hee hee. And by the way, first trimester knitting, for me at least, and other bloggers who have fallen off the face of the earth*, was non-existent. But I might have gotten this project done, since it's so quick and do-able, had I had it a few months ago. So, for that first-trimester pregnant knitter in your life (and there are more out there than you think! ), this is a great present! * Note that I have an n=4, maybe 5, but I have noticed a pattern of knitters falling off the face of the earth for a while, only to return with the news of a bun in the oven. So watch out, because if you disappear, I will start to assume you are preggers! 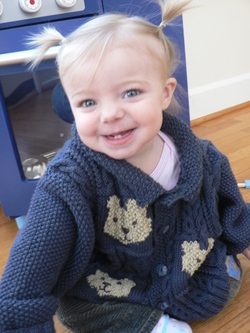 ** One of the biggest advantages to knitting for babies is that you can indirectly compliment your own work, and make it look like you're just awed by the cuteness of the "baby factor." It's quite fun! 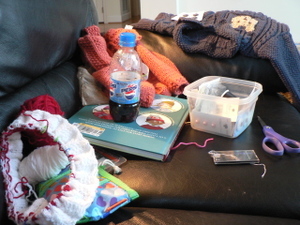 I suppose I did say I would show progress photos from my trip to France - but the truth is, all that knitting is downstairs...and I am upstairs...and so, well, I will assume it will not be breaking my promise if I show it at some point (but not tonight). Hee hee, this is my ploy for building up the suspense! For now, I will show you the project that came in the mail thanks to Kristine and her helpers over at Knit Happens On-Line. It's the Debbie Bliss Patterned Yoke Jacket from the new Simply Soft book (which, by the way, is dedicated to Kristine...wow!). Okay, okay, my laziness about going downstairs is providing for dull blogging content, so I guess I should show you a photo of something cool. I know! How about more from my trip to France? This is the barge that we stayed on - it was built in Belgium in 1909 and at 22 meters in length, has enough room for 4 bedrooms, bathroom, shower, and a living room and dining room! It was so fun to cruise the Somme River, watching the French paysage go by, and to go through all the locks! And this is a photo from one of our hikes in the Alps...look at those beautiful flowers! Okay, okay, did I make up for the boring knitting content? If not, I will next time!